In opening this workshop, allow me to describe the position of Electromagnetic Non-Destructive Evaluation in the maintenance of Nuclear Power Plants (NPP) and its share in the stakes of EDF. For the first time in its history, nuclear energy in Europe is on the verge of a decisive turning point. Several parameters have recently come into play to modify the scenario, such as the deregulation of the electricity market, the appearance of new means of production (fluidised bed coal boilers, small unit co-generation, etc. ), but the essential parameter is the drop in the price of fossil fuels, particularly of natural gas. Figure 1 shows the reference cost curves used to forecast the price of 1 kWh produced by an up-to-date power plant, burning different types of fuels. to extend the life of financially amortised plants. The examination of Steam Generator (SG) tubes. The examination of Rod Cluster Control Assemblies (RCCA). The strategy employed for these two examples illustrates the procedure applied also to other components. 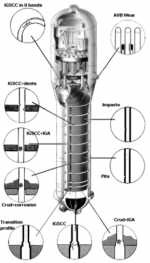 These tubes are the place of transfer of all the energy from the reactor core to the turbine through the boiling of the water in the secondary circuit. Substantial degradation in these tubes is due to the choice of the Inconel 600 alloy as the tube material. This choice was made for the great majority of PWR plants throughout the world. The stress corrosion cracks (IGSCC), appear from the primary side in the deformed zones like the U bends or the transition at the top of the tube sheet. But also it was initiated from the secondary side in the areas of concentration of pollutants, which are the deposits above the tube sheet or in the interstices between the tube and the tube support sheet. 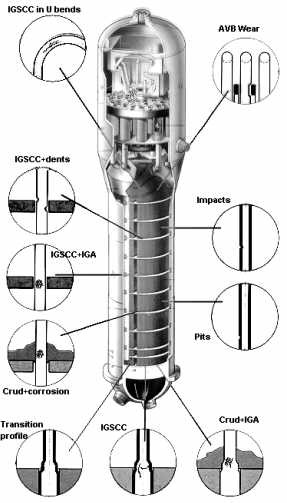 Generalised micro-cracking (Intergranular Attack IGA) due to corrosion has also been found under the deposits accompanying the IGSCC. Metal losses through wear have been observed at the anti-vibration bars (AVB) level in the top of the bundle and on the periphery in contact with loosing objects fallen into the SG. Figure 2 shows the zone where each type of defects appears. 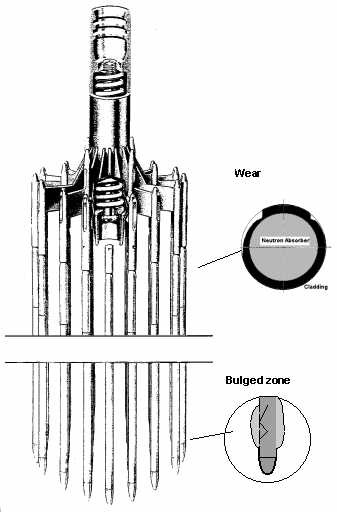 Inspection of the tubes is done with an axial probe with two coils over the whole length of the tube. 320,000 tubes were examined in this way in 1996. In addition, to measure the length of cracks and be able to characterise them more readily, several rotating probes with two differential coils with ferrite cores are employed locally. More than 300,000 tubes were examined in the same year. or the presence of an interference signal due to the environment (such as the magnetite or copper deposit, the presence of steel sheet or bars, local deformation such as rolled expansion, bending or denting). The policy followed by EDF has been not to plug the tubes on a defect signal associated with a theoretical depth without knowing the nature of that defect and assessing its behaviour and its harmfulness. Hence, besides the very numerous laboratory simulation studies conducted to learn how to recognise the type of defect, some tubes of the SG in operation have been pulled out for checking and validating the diagnosis made by END. Up to the end of 1996, 375 tubes were pulled out which represented approximately 2 milliard Francs for investigations, without counting the loss of production due to the duration of the removal operation. This whole procedure has enabled EDF to define a plugging policy suited to each degradation and closely linked to the ECT signal identified. These are the fine rodlets, 10 mm in diameter, the 0.5 mm cladding of which encloses a neutron absorber which enables the fission reaction to be controlled and stopped. They are grouped in clusters of 24 rods and inserted into different zones of the core. Wear and tear, due to vibrations induced by the circulation of the fluid in the core, appears in the areas of friction by the rod against its guide. Locally it can lead to the puncturing or indeed the fatigue rupturing of the rod. For certain clusters, the end of which is inserted into a dense neutron flux, the irradiation causes swelling of the absorbent which expands the cladding until it cracks. The swelling also leads to a slowing down in the descent of the cluster or its jamming. Figure 3 shows the location of the defects. The examination of each rodlet by an encircling ECT probe allows the presence of defects to be discerned. 24 coils enable the simultaneous inspection of a complete cluster. In 1996, the number of clusters examined was 32,000. The hot laboratory investigation of several rods has enabled a relationship to be established between the mean section of wear and the ECT signal. However, some kinds of wear in the form of a V were poorly estimated. Similarly, in the swollen area, the cracking may be masked by the swelling signal. The solution to these two problems could not be found by the eddy current method. Therefore, profile measurement by a rotating ultrasonic probe is used each time the ECT signal in any area of the rod exceeds a predetermined threshold. The establishment of criteria linked to the ECT signal has enabled a policy to be defined for scrapping a cluster or for using it for one or two cycles after its neutral position has been modified. The efforts expended in finding out the true mechanisms of degradation and the soundness of the END diagnoses, demonstrated in numerous cases of verification by analysis of the parts removed, have enabled the safety of these components to be established. This policy necessitates perfect reproducibility of the measurements and their interpretation over the years in order to guarantee rigorous monitoring of the kinetics of evolution of degradation. For example, the accuracy of the length of the cracks in the tubes is of the same order as their lengthening in one cycle; this enables them to be monitored over several cycles before reaching the size required for plugging which, that too, leaves a margin in relation to the critical size defined by the safety studies. enforcing service companies utilising these measures in their own industrial tooling. or of eliminating a succession of cluster inspection campaigns to arrive directly at their replacement. The development of the policy in matters of safety is pushing the regulators to demand that processes be qualified by an independent organisation. This is going to lead to formalising requirements and to conducting demonstrations of performances. So as to limit the tests, there will increasingly be recourse to mathematical modelling in order to explore the parameters of the methods. Similarly, the common use of recognised mock-ups (via the ENIQ for example) will allow the costs of creation to be shared. As has been noted above, to reach a final diagnosis, two or more ECT probes are employed, or indeed another method, that of ultrasonics, on the same component. To reduce the examination times, and therefore costs, we are going to try using multi-technique "probes" simultaneously. The data processing systems should be available commercially and should enable a diagnosis to be produced in real time. Despite the use of different techniques and different service providers, it must be possible to compare easily the results from one campaign to another, hence the obligation to work with a common data format. These three notions (shown in bold) constitute the main lines of progress along which EDF is counting on moving in the future with its partners.